A wide pocket of sand, Kaimana Beach lies between the War Memorial Natatorium and the New Otani Kaimana Beach Hotel. The beach takes its name from the hotel, which was named for Kaimana Hila, or Diamond Head. Kaimana Beach is also known to local residents as San Souci Beach, an old name that goes back to 1884 when Allen Herbert bought several acres of land here and opened a lodging house. He named it Sans Souci, French for “without a care,” after the palace of Frederick the Great in Potsdam. On the morning of December 28, 1902, an important event took place at the beach when the steamship Silvertown anchored offshore after a 12-day crossing from San Francisco. The Silvertown had layed a submarine cable from California to Hawai’i and the end of the cable was brought ashore through Kapua Channel in a canoe steered by David Pi’ikoi Kahanamoku, an uncle of Duke Kahanamoku. The cable was the first telegraphic link between Hawai’i and the mainland, an important event for communication and navigation in Hawai’i. The first message over the new system was sent on January 1, 1903 to President Theodore Roosevelt in Washington. Remnants of the submarine cable, abandoned in 1951 for newer communication systems, still lie on the ocean floor in Kapua Channel. 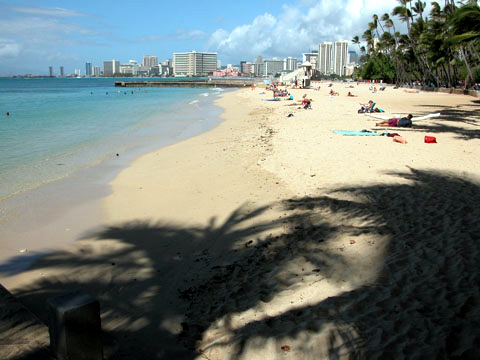 Many local residents consider Kaimana Beach one of the best family beaches in Waikiki. Protected by a wide reef, the nearshore bottom is shallow, sandy, and free of strong currents. Open ocean swimmers and kayakers also frequent the beach to access the waters beyond the reef through Kapua Channel, which also leads to Old Man’s, a popular surf site.